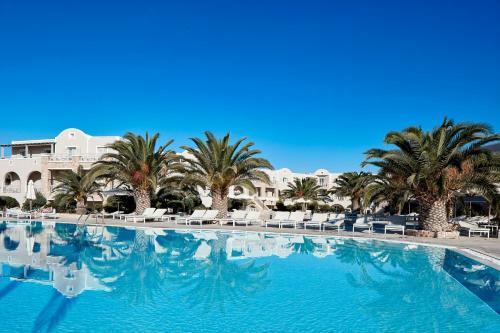 Santo Miramare Resort is 4-star hotel located at the beach in Perivolos, Santorini. The hotel offers to its guests restaurant (buffet), garden, bar, restaurant	and outdoor swimming pool. The property accommodates visitors in studio, family room, triple room, double room and other might be available upon request. The rooms provide sea view and pool view. Room amenities include a/c, satellite channels, fridge, etc. In the kitchen there is fridge. Fields with * are required. The enquiry is sent directly to Santo Miramare Resort.